Roach is one of the most common fish of the carp family, which is found in reservoirs of Russia everywhere. Its dry and rarely cooked any other way. For drying, this fish is ideal. Prepare dried roach small size (up to 500 grams), not when carving. Flush the roach in cold water, let it drain, but do not wipe and do not obstinate wipes. Take from 150 to 350 grams of salt per kilogram of fresh fish depending on what salinity you want. Sometimes salt add a little sugar for a more delicate taste (one kilo of fish, approximately one-quarter teaspoon). Mix roaches with salt and fold in the wide enamel ware (a bucket or tub, stainless steel vessel). Put on top of the cargo cover with stone, wooden circle with any container filled with water. The load needed to fish was always immersed in the brine. Leave to proclivities for one or three days depending on the size of the fish. Have a large roach (from 500 grams and more than): make a longitudinal incision along the abdomen, remove all the viscera, including ROE and milt, wash in cold water, and stuff the belly with salt, carefully RUB the fish around the gills. 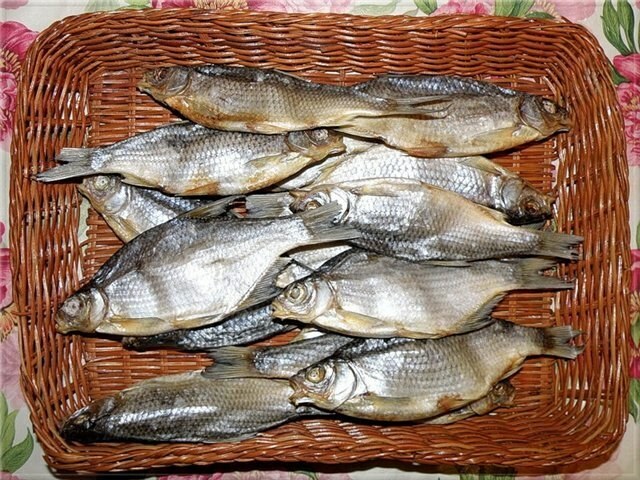 Then place in rows in an enamel bowl, bellies up, top fill with salt (can not put the goods, to cover only the gauze, the fish is salted dry method). Express large roach to proclivities three to six days in a cool place. Then soak the salted fish to the desired degree of salinity. Rinse it in cold running water, soak in fresh water for some time (sometimes the fish is soaked as much time as she was in the brine), then rinse again and hang to dry. Thread pieces of wire through the eye sockets and hang in a shady, breezy place. Place the fish on a rope loosely to the carcass is not in contact with each other. Peel back the gills to the outside to accelerate the process, in the bellies of large fish sticks insert wooden spacers. Hang the fish in the evening to get it dried out over night and not so much attracted flies. Use gauze covers to protect from flies, also, it is possible to spread sunflower oil fish heads, as it takes away the smell that attracts insects.